"I love the Western Isles, though I must say, it’s a bit breezy here," Bonnie said, straightening her bent antenna. "I’m glad I’ve got an extra layer of fuzz on this time of year." "It can be nippy here. Ah, there’s Lewis, our first stop. I really wanted to show you the Standing Stones of Callanish," Bruce said. "Is it warmer there?" Bonnie asked. "There are plenty of stones to stand behind and they’re large enough to block the wind," Bruce told her. "Good. I see them now," she said, pointing. "Oh, they are magnificent and I’m sure you know all there is to know about them. Am I correct?" "Well, yes, I do know a lot about them. They’re over 4000 years old and there are 53 stones, with 13 in the center," he began. "They are also very light gray. What kind of stone is that?" Bonnie wondered. "It’s that Lewisian gneiss again. Remember, we saw some stones made of that before?" "Oh yes. I do remember that odd name." "The stones were probably used for things such as predicting eclipses and such. There are plenty of stones scattered about the island. It’s mostly peat, which means boggy and marshy. Let’s land behind that stone in the center. It seems to be the largest," Bruce suggested. When they touched the ground, it felt spongy to them. The stones did block the wind. Bonnie leaned against the stone. "What a relief. Finally I’m not freezing anymore!" "Oh look, a mushroom," Bruce said. "In fact there are several of them." "I see them. Do you think there are any flowers about? It is rather chilly here." "I’m sure there are wildflowers. Say, once you warm up, there’s this whalebone arch down on the beach. It’s made of the jaws of a whale and its quite interesting, so I’m told." "Maybe the beach will be warmer than it is here. Let’s go and find the whalebone right now," Bonnie said. The two butterflies fluttered down to the beach. They spotted the arch right away and flew towards it. Bonnie noticed two seals lying in the sand not far away. "Look at the seals!" "I suggest we go quietly and not disturb them." They landed on the top of the arch. One of the seals opened is eyes and looked at the two butterflies. "ARF! ARF! ARF!" The seal began to bark at them. The other one woke up too. They sat up and headed towards the arch. "ARF! ARF! ARF!" "Yikes! They can’t reach us way up here, can they?" Bruce wondered. "I don’t think so. Just stay still for a bit," Bonnie urged. 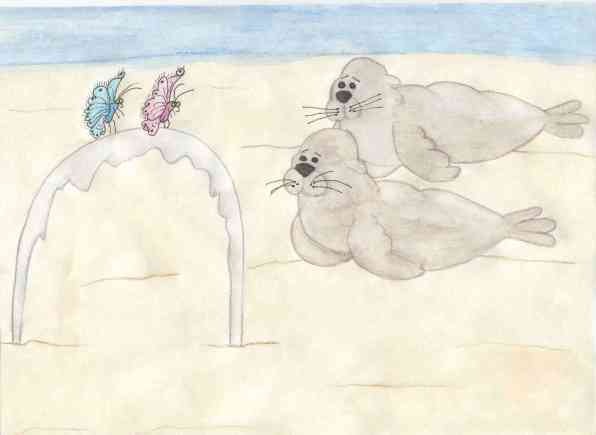 The seals came right under the butterflies and started throwing sand at them with their flippers. "Stop that!" Bonnie shouted. Sand flew everywhere. "ARF! ARF! ARF!" The seals kept on tossing the sand. "It’s getting in my eyes," Bruce whined. "I guess the seals don’t want us on their beach," Bonnie said and flew into the air. "That’s much better. The sand can’t reach us now." Bruce joined her and they flew away from the beach, leaving the barking seals behind them. After a while, Bonnie asked, "Where’s the nearest city?" "It’s called Stornoway. It’s the capital. I’m sure there is somewhere warm there and probably a flower garden or two too," Bruce said. Stornoway is a busy ferry port. Boats go in and out of the harbor constantly. Many of them fishing boats as there is a large fishing industry in the town. "You know what happens when the fishing boats come in, don’t you?" Bonnie said. "And here they come, right on schedule. Yikes!" Bonnie called. "Let’s get out of here. NOW!" The two butterflies fluttered away from the sea just as the boats came in with their daily catch. Swarms of seagulls followed and filled the air like midges. "We’ve got to be more careful of these fishing villages," Bruce snickered and they flew towards a patch of yellow gorse for a good night’s rest.